Most adults would cringe at the idea of his/her family playing matchmaker is cringe-inducing (they don’t even know you hate green beans, after all). The families of Tara and Michael, however, nailed it. 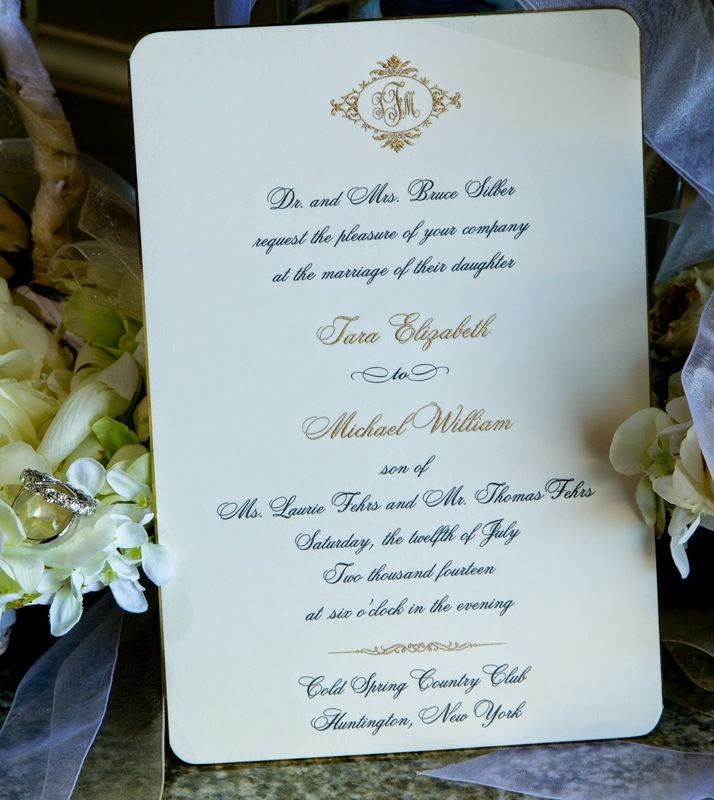 The couple married in Huntington, New York over the summer, a wedding guests were invited to via a stunning rounded-corner William Arthur invitation printed in gold and charcoal ink and topped with a lovely monogram (a trend we’re seeing a lot of these days). Of course, the finished product couldn’t have been done without the help of Jill Price, owner of JillyP Invitations & Gifts. 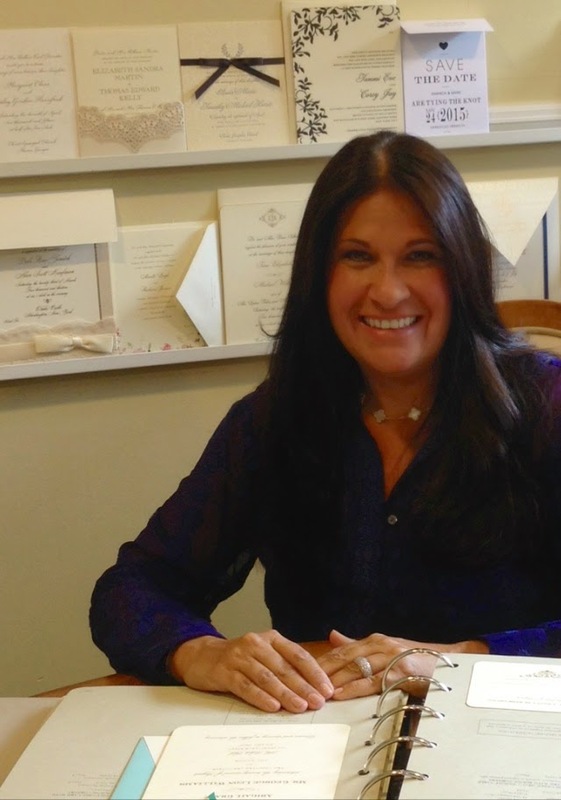 Here, they talk about details, choices and the importance of patience—at least when it comes to wedding invitations! Tell me how you are your fiancé met. How did he propose? We were actually set up by our families! Our mothers knew each other and thought we would make a perfect match... they were right! Michael and I were on vacation and he proposed in Sedona, Arizona. It was such a beautiful setting and I was so surprised! Tell me the process of choosing your wedding invitations—did you have something in mind going into your first appointment and did that change? I always knew I wanted gold accents and some sort of monogram! That's exactly what I ended up with! I absolutely loved the invitation I chose and it was perfect. While looking through the William Arthur book, I found the monogram motif that I fell in love with. Jill had the idea of incorporating charcoal grey ink with the gold and the combination looked beautiful! I was not expecting all the different font choices and the many details that had to be decided upon. Look at everything! Do not rush the process. Be sure your stationer is experienced and detail orientated. My wedding was perfect! It was everything I wanted and more. 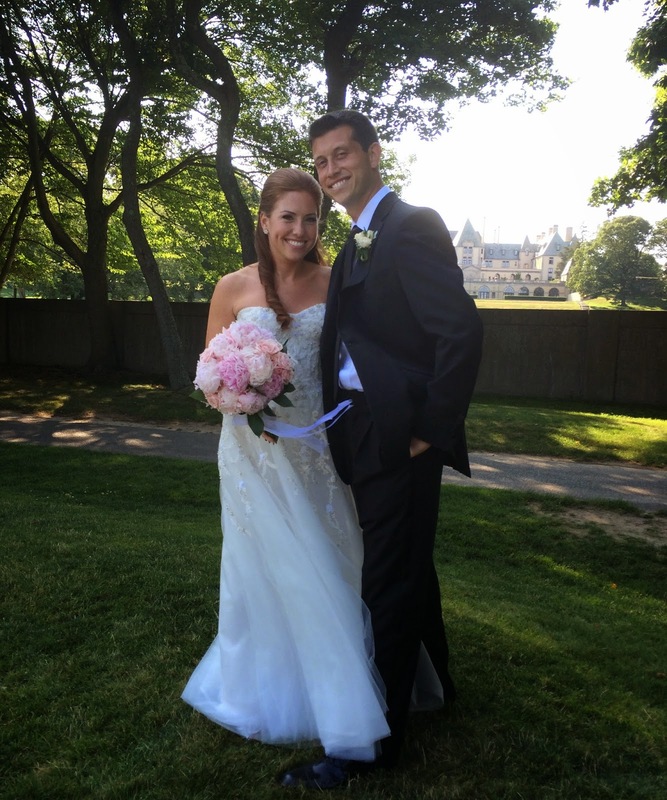 My favorite moment was the intimate ceremony shared with my husband, family and friends. The amazing night didn't stop there... everyone was out of their seats and on the dance floor the entire night. Many guests said it was the best wedding they have ever been to! Tell me about your first meeting with this bride and a little about the process you went through to get to the final decision. I love to brainstorm with the bride about what her perfect invite might look like before I even introduce a book. I like them to dream big and then choose a handful of books to relax and look through. As the process continues I provide more logistic details about pricing and pros and cons of each of her choices and ultimately she makes the final decision. I always want to know if they are looking for a more traditional or contemporary style, their budget or how familiar they are in printing options such as engraved, letterpress, thermography, etc., and I always need to know what our time frame should be for the invitation process. I like to work backward from that point. What are some of the big invitation design trends you're seeing these days? All of my brides recently have been choosing their own monograms and most times they want silver or gold ink. I tell them to bring pictures or other invitations they have received and liked. Don't worry if you don't know exactly what you want. Come with an open mind and ready to see or explore all the different options. Today's brides are thinking a lot more out of the box. Destination weddings have been increasingly popular, which requires so many more elements that need to be coordinated for the invitation. The partnership between the bride and groom is even stronger now than five years ago!